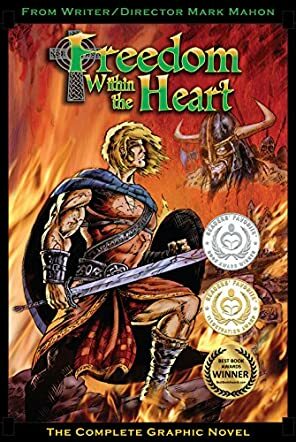 Freedom Within The Heart by Mark Mahon is the story of the Viking invasion of Ireland, and how the Irish clans dealt with that rather unpleasant visit. Mahoun and his brother Brian Boru are the centre of the story, and of course Brian is the hero of the title. And he is indeed a historical figure of Irish history. So this comic is not only entertaining but also a good way to get people interested in that part of history. It's a different kind of historical fiction, and of course has a bit of folklore mixed in. Apparently, the story behind Freedom Within The Heart by Mark Mahon will be turned into a movie, and I can imagine how this would work quite well. It all starts with the childhood of the two brothers who witness how their parents are brutally murdered by the invading Vikings. That experience leads to them growing into men that will play a vital role in the fight against the invaders. The story is full of action and a fair amount of violence, but it also does not lack moments of emotion and drama and some fun. I thoroughly enjoyed reading page after page, and it taught me something about Irish history that I did not know. I am sure that this kind of format would also be quite valuable to older students for history classes (as traditional history books can be so off-putting).